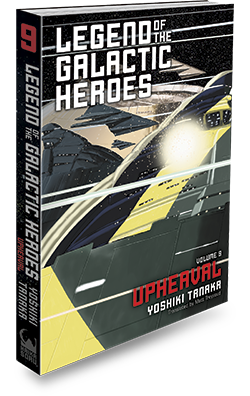 ﻿ Legend of the Galactic Heroes, Volume 9: Upheaval « Haikasoru: Space Opera. Dark Fantasy. Hard Science. The irregulars of the Iserlohn Republic, still loyal to the ideals of their former leader Yang Wen-li, rally around Yang’s successor Julian as he strives to live up to his inherited responsibilities. Meanwhile, in the empire, Kaiser Reinhard survives an attempt on his life only to be confronted with the devastating sins of his past when he learns the true identity of his would-be assassin. Despite rumors of treason on the part of Neue Land governor-general Oskar von Reuentahl, the kaiser pays a personal visit to that territory, where an even greater shock lies in store.